To date fewer than 600 humans have been to space. Just 600 on a planet of more than 7 billion. Space exploration for the likes of most of us feels just as far away now, as it did back in the 1960s. In fact, you could even argue it seems further away, with the optimism galvanised during the original Space Race it felt almost certain that we would be spending our holidays in space, perhaps even the Moon and Mars by the end of the 20th century. According to Apollo 11 Moonwalker Buzz Aldrin, ‘if we had carried on with the same momentum as Apollo we would have been on Mars by the 1980s or 1990s at the very latest.’ Back then, a few rather ambitious aerospace companies had even printed tickets for would-be tourists. Gene passed away in January of this year. It was my privilege to work with him on the film Last Man On The Moon, executive produced by (among others) Space Angels member Keith Haviland. Captain Cernan was the epitome of an American Hero and one of the most inspiring people I have ever met. But he made no secret of the fact that he did not want to maintain the title of the ‘Last Man on the Moon’. One of his many mantras was that ‘perhaps we just got the timing wrong’. I, like many others, agree with this and believe that now is truly the time for space. The best comparison for me is that Apollo can be thought of as the Columbus ‘moment’ and we are now entering into the ‘Mayflower moment’ with this new private Space Race. Change is happening thanks to private industry, including many of Space Angels’ portfolio companies, and change is happening fast. This year’s Space Angels Expedition in Houston was based around that very theme, honoring the past and fueling the future. As part of the Expedition, I found myself standing in Historic Mission Control—an area off limits to most, to which Space Angels was granted unique access—a stark reminder that the Moon Landings are no longer a recent event. For the most part they are now consigned to the history books. The historic site is currently in the process of being restored thanks in part to the city of Webster and generous donations from the public, including Space Angels members. The worn carpets and mint green desks are a reminder of just what humanity can achieve. Right of the main screen is an American flag, flown to the Moon as part of Apollo 17. On another, the mirror from the Apollo 13 Lunar Lander Aquarius, framed in Mission Control to reflect the image of the people who got the crew back. Symbolic reminders of where we have been. No matter what happens next in our space future we, as a species, will forever be standing on the shoulders of giants—those heroes who helped humanity take that first leap into the unknown. It is my long held belief that, although it might not be obvious to everyone now, the exploration of space is the most significant thing we will ever do as a species. The access granted by this year’s Expedition enabled members to truly reflect on where we came from and why the best way to honor those who took the first steps to the stars is to fuel the future of space exploration. And that future is a combination of public and private sector innovation. That is what I believe the heroes of Apollo would want. 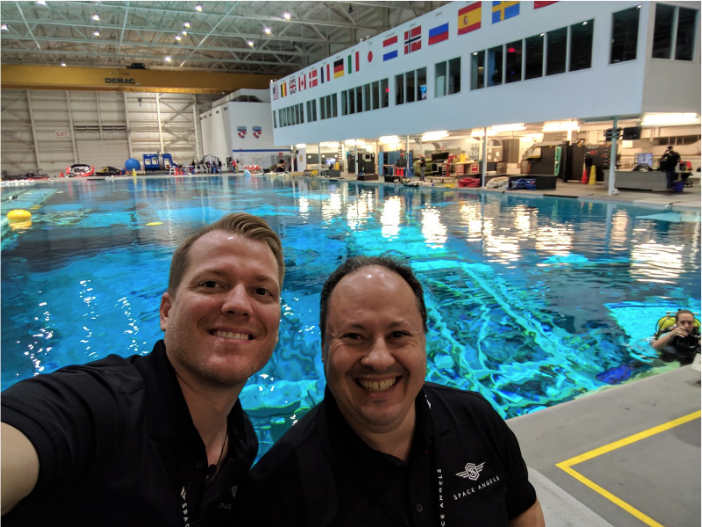 Touring the facilities at NASA’s Johnson Space Center, the home of human spaceflight, you realise that while we might not yet have the space future many had hoped for, we have still come so far in space exploration. As our NASA guide reminded us as we walked into the newly developed human spaceflight research facilities, “the gateway to Mars is through these doors.” As a child of the 1990s, I truly believed we would be on Mars by 2020. That deadline has slipped back a little and there are still numerous hurdles to overcome. But to be able, as part of the Space Angels Expedition, to meet with and hear from those engineers, scientists, and entrepreneurs who are laying the foundations and working to overcome the challenges to get us to Mars is beyond inspiring. How fortunate are we to be part of a generation which is helping to enable humanity to reach out into the Solar System once again and eventually see human footsteps on the Red Planet. This is just the beginning. While a mission to Mars and a return to the Moon beyond just flags and footprints may still be a few years off, all these things and many more that we cannot yet imagine, will happen. Pushing forward humanity in space, as well as creating a new industry and helping to improve lives for everyone here on Earth. Throughout history it has been the mavericks and the dreamers who have enabled us to push forward as a species. Space is no different. It is merely the next frontier. Expeditions such as this fuel my optimism for our space future. I am excited and hopeful for the possibilities to come.